At today’s Redevelopment Commission meeting, the board approved a motion for Faegre Baker Daniels (FBD) to assist with advancing the Rails to Trails project. The vote was 4-1, with the lone dissenter being Scott Stewart. The Rails to Trails project would convert an old, abandoned CSX route that runs through 63 miles of some of Southern Indiana’s most scenic and natural landscapes into a recreation trail. The trail begins just north of the new Sazerac facility (at the former Pillsbury Plant) and ends near Bedford, Indiana. Over the past year, city officials have worked quickly to advance the Rails to Trails project. 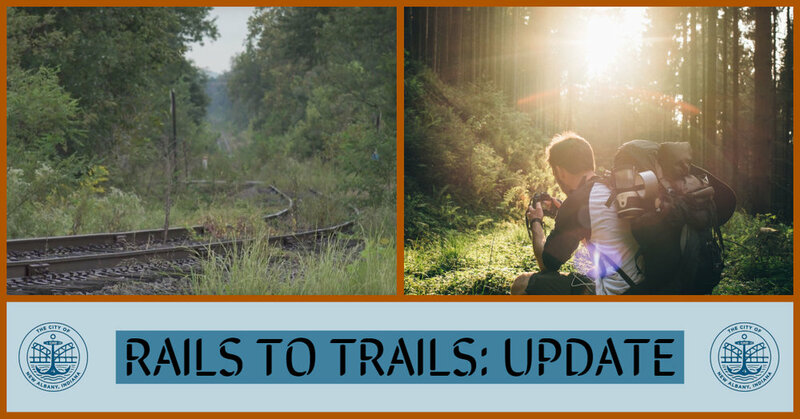 The city began in December 2017 by filing necessary paperwork securing the right to acquire the corridor under the Trails Act. The city then began developing a working relationship with the Indiana Department of Natural Resources, who now supports the trail development. Mayor Gahan has met with the majority of the towns and counties on the CSX line, and has received unanimous support for a trail. Additionally, Governor Holcomb announced on September 6th the availability of $90 million worth of funds to support trails in Indiana. FBD will now assist by completing negotiations with CSX to determine a final cost of the corridor, prepare an initial development plan and funding strategy, and prepare an application to the State of Indiana for funding of the corridor acquisition. Election Day 2018 is Tuesday, November 6th. Polls will be open from 6am-6pm. If you have any questions or concerns, please call the Floyd County Clerk’s Office at 812-948-5419. In cooperation with the New Albany Tree Board and New Albany City Council, Mayor Gahan moves to improve our local tree canopy and advance a long-term comprehensive plan to protect and manage trees in New Albany. In early 2017, the City of New Albany received $20,000 through the Community and Urban Forestry Assistance Grant, one of ten municipalities that received the grant throughout the entire northeast region of the Department of Natural Resources. 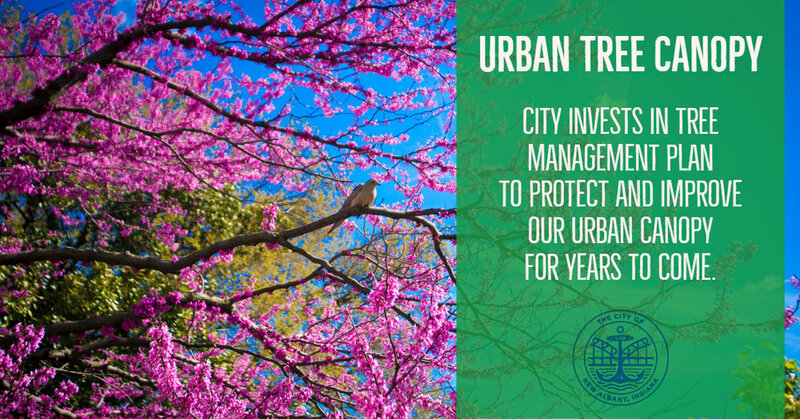 Through this grant, the city was able to complete an inventory of all city-owned trees in the public rights-of-way and city parks. The inventory was then utilized to draft a management plan that provides details on how to improve and maintain the urban tree canopy. There are currently 7,777 sites that were added to the inventory, including 5,244 current trees, 197 stumps, and 2,336 vacant planting sites. The inventory showed that most of our trees are in decent condition. This is in part thanks to a multi-departmental effort by the city, including hundreds of tree plantings for sidewalk and roadway projects through the Redevelopment Commission, maintenance of current trees by the Street Department, and new proposed legislation that includes Tree Preservation standards like in the new proposed Zoning Ordinance that will be coming to the council soon. In late October, the city will be utilizing the remainder of the Community and Urban Forestry Assistance grant to plant 50-60 new trees coinciding with the tree management plan. Tree Board staff member and Chief City Planner Krisjans Streips will speak at tonight’s City Council meeting, providing an update to council members about the current status of our tree canopy and the need to complete the remainder of the Tree Management Plan. Mayor Gahan will ask the New Albany City Council to appoint a small committee to begin discussions about the new opportunity for a Rails to Trails route from New Albany northward. The route is 63 miles long and would traverse along the recently abandoned CSX route through some of Southern Indiana’s most scenic and natural landscapes. Mayor Gahan is very excited about Governor Holcomb’s initiative to dedicate $90 million towards trail funding throughout the state of Indiana as announced on September 6th. Harvest Homecoming Fiesta Rides - $5 Discount Coupon Available NOW! 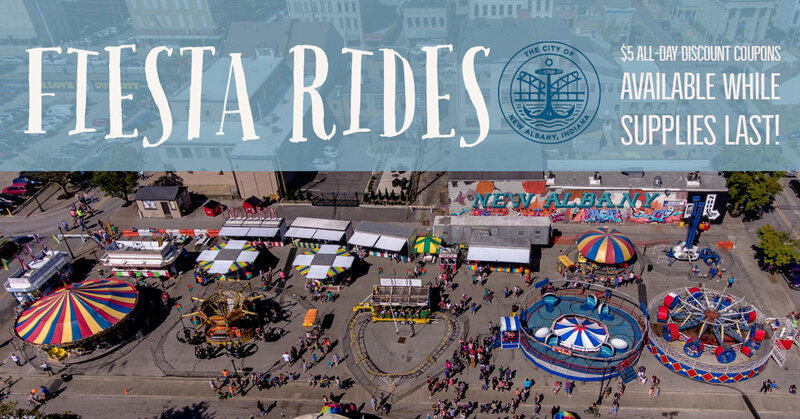 For the past several years, the City of New Albany has provided discount coupons for the Harvest Homecoming All-Day Fiesta Ride Bracelets. Bracelets are normally $15, but you can receive $5 off the price by picking up a coupon from either the Griffin Recreation Center from 10am – 4pm (1140 Griffin Street) or Silver Street Park from 8:15am – 4:15pm (2043 Silver Street). Coupons are available Monday-Friday. Coupons are limited to two (2) per person while supplies last. Coupons are valid from October 6th through October 10th, 2018.